This is the first PC product I've ever had a negative experience with. At first I applied the serum over most of my face at night time, and found that I'd wake up with a couple of pimples on my chin/mouth area, which is usually a rare occurrence for me but something that happens now and again. So I decided to try it only on areas where I literally never break-out instead, around my eyes and temples, and now I've started getting whiteheads there for the first time ever. In addition to this, I really can't say I've noticed any improvement in terms of what the product should do - brightening, firming etc. It's a shame that I'll have to throw the product away now, because it wasn't cheap! Customer Care: Thanks for letting us know of your experience - we're sorry to hear this didn't work for you! We encourage you in these cases to contact our customer service team, who might be able to provide you with a refund and skin care advice. Nissy - Not suitable if you're trying to get pregnant! Customer Care: Hi Nissy, I'm sorry to hear this was not clear enough. We will sure pass this feedback along! I use this everyday. I have the annoying combination of oily skin with wrinkles(!) This moisturizes without greasiness, reduces wrinkles, has also helped with a dark patch of skin. Feels lovely to put on. Amanda - the retinol affect! I bought the trial size of this and love the packaging, makes even a trial size product feel luxurious. This stuff is really, really greasy with a little going an extremely long way! However, once you get it on it does sink in which amazes me, given how greasy it first appears. The blurb on the trial size product says that you could use this under some makeup...I'm gonna say...NO WAY! Although this sinks in and I actually love this product, there is NO WAY I would use this either under makeup or even during the day. I mix this with either the 1% retinol or the Resist Anti-Aging Intensive Repair Cream, as part of my night time routine and it certainly helps prevent retinol side effects and makes the repair cream go even further. I use 5 PC products with retinol in and my under eye area has been transformed, my dark circles are much lighter, eye bags reduced and fine lines gone, my husband has even noticed and I don't have to use a whole bunch or products to cover everything up anymore! However, I don't know which product is responsible or whether it's the combination effect and if so, which combination so I'll just have to say it's the retinol effect! Unfortunately this product doesn't work with foundation. I use this serum every other night and my skin looks fresh and smooth without make up, but after I apply foundation my skin is very flakey and horrible. I don't know what to do anymore, I am using it since 2 weeks. Should I continue using it? Customer Care: Thank you for your review. We are sorry to hear of your experience with this product. Although this is not a common response, we do understand that each customer is uniquely different in how they will respond to products or ingredients. Our customer care team has contacted you by email for an alternative product. This stuff feels beautiful and the skin and really is marvellous at doing its job. The only thing I don't like about this product is the packaging the words "wrinkle-repair" is not something I like sitting in my bathroom when I have guests. It's a shame because the bottle is beautiful chrome finish. Paul - Quickest route to supple skin. Adding this to my nightly routine was the best decision I've made in quite some time. My skin is looking and feeling smoother, and my dry, reddened and flaky skin has been have been dealt with - quick-sharp. I've always had a kind of love / hate relationship with retinol in the past- either companies provided too little of the active ingredient to make a discernible difference, or too much which irritated my skin, and thus was clearly unable to handle. This Resist product is absolutely perfect in that regard (for my needs). It has boosted my confidence by adding back this amazing ingredient into my daily routine, and I feel there has been almost a synergistic effect in all of these great ingredients working together - without the negative effects. It feels a little greasy at first (I like to mix my product with my nightly Barrier repair Moisturiser & HA Booster) but it soon sinks in, leaving soft and glowing skin. I also have no irritation using this retinol serum after my BHA products, but you will need test the waters yourself. Absolutely 5 stars and highly recommended. I love this serum. It's my favourite of all the PC serums I've tried. Even though it has a good percentage of retinol it doesn't cause any irritation of my stupidly sensitive skin. I use it at night, as I prefer a product without retinol during the day. It has just the right amount of emoillents for me, so is fairly quickly absorbed and doesn't end up on the pillow, but leaves my skin super soft too. I can't attest to the long term results yet, but so far it's earned its place as a staple.The packaging is very easy on the eye, but I just hope the pump holds up over time. Just an aside - more frequent free P+P would be very welcome. Rosana - Great product, excellent customer services. I just want to say this a fantastic product, the best on the market. I'm so impressed with the prompt customer services and the way a issue was handled. Thanks for your patience and answering thousands of questions. You people are the best. I absolutely love this serum. I cannot do without it. My skin is clear and so soft and smooth. I know that it is a combined effort of all the PC products I use. This one makes my skin brighter and fades dark spots. I am glad I took my chances with PC as I had given up trying product after product for my skin. Thank you. You are a great team. I also want to mention how helpful the customer service team is. Prompt, polite and very helpful. Customer Care: Thank you for your review and compliment. It's great to hear that this serum worked so well for you. We are always delighted to hear from our customers. Bought trial size only. Didn't like it at all. Clog my pores. Really impressed after sampling bha 2% liquid and this Retinol serum for a few nights, clear moisturised skin, sorted out my mild stress-acne, fine lines and skin looks much more even. This combo is definitely a future full-size purchase, bha 2% and Retinol are must-buy for everyone, who battles sun-spots, break-outs and fine lines all together. I found this very easy to use, no irritation whatsoever, although my skin is quite sensitive otherwise. Previously, I haven't been able to use retinol products from other brands more than 2 nights in a row, usually I've used every other, or every third night as skin has become flaky and slightly reddish. This is normal, and I don't mind alternating, or layering natural oils underneath as I know our skin has to get used to Retinol, but this serum is dream to use, everynight serum. The only mild con for me personally is that it has quite silicone-rich texture, but apart from this - Excellent! Customer Care: Thank you for the review and the kind words. We are always happy to hear when our products make a difference! Surprisingly hydrating and calming on the skin. Only used it once from a sample and perhaps a longer use is needed to see any results but feels nice on the skin, especially as part of night time skin care as this is oily, sticky consistency. Could use it around the eyes as well. Hydrating and moisturising enough by itself that I didn't use any moisture to follow up after. I love this serum. 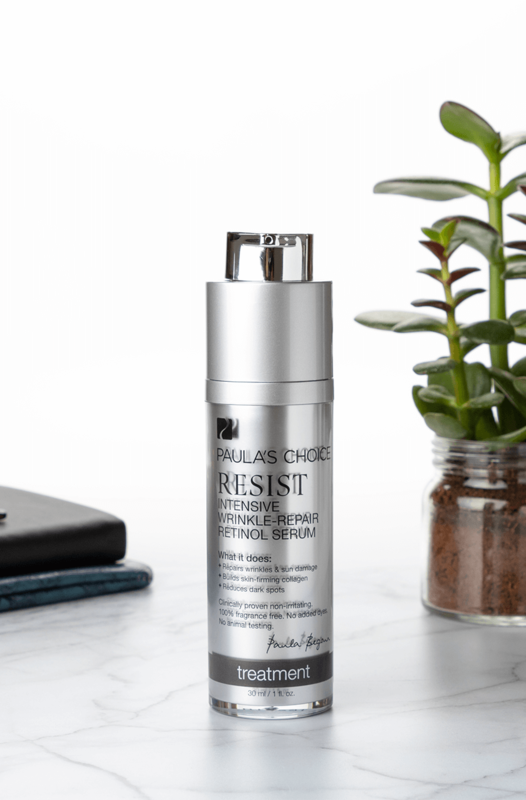 I use it on alternate nights (I use the Paulas Choice 1% Retinol cream on the other nights) following this serum with the Resist Barrier Moisturiser with Retinol and for me it's perfect. It's a lovely consistency which soaks into the skin almost immediately and my skin feels soft and smooth straight away. Using this serum with the Resist Barrier Moisturiser, I go to bed with lovely feeling skin which does not feel greasy and my skin looks and feels great when I wake the next morning. My skin has never looked so good and this is yet another one of the fantastic Paula's Choice skincare products I will not be giving up! Dawny - Surprisingly well liked serum by my combination skin! Sadly, this caused burning and some reddening. It took several applications (maybe 6 )for this to occur (I used it nightly). I get reactive redness over my nose and have been prone to peri-oral dermatitis in the past. My skin got a bit redder over the cheeks and nose. My skin must have become sensitised to an ingredient (s) or the amount of retinol, perhaps. However, many reviews here are very positive. No harm in ordering a sample first. We are sorry to hear of your experience and discomfort. Customer Care: Thank you for your feedback. Although this is not a common response, we do understand that each customer is uniquely different in how they will respond to products or ingredients. Perhaps RESIST Super Antioxidant Concentrate Serum that doesn't contain retinol is a better option for your skin. I got the 7ml deluxe sample and loved it. If I had not been going to get the ultra light serum already would have grabbed the full size as well. The only thing I can say is I really wish I would have found it sooner! Thank you Paula's Choice for this and all other amazing products. One 1ml sample lasted three applications (face and decollette) so a little goes a long way. Greasy on application, but the volatile silicones evaporate off fairly quickly leaving silky skin. I haven't experienced any irritation or adverse reaction even used twice a day or on irritated skin after microneedling. I will not purchase the full size because I am not keen on silicone heavy products. I purchased this product, along with the Paula's Choice Resist Advanced Replenishing Toner, and I have been using both for over five weeks now and have noticed no discernible difference in my skin whatsoever. If anything, my skin seems slightly more irritated and prone to spots. Although these products are by no means the most expensive, it still felt like an investment at £55 for the two. Since having both my children, my skin has gone from good to tired-looking, blotchy, bumpy and haggard. 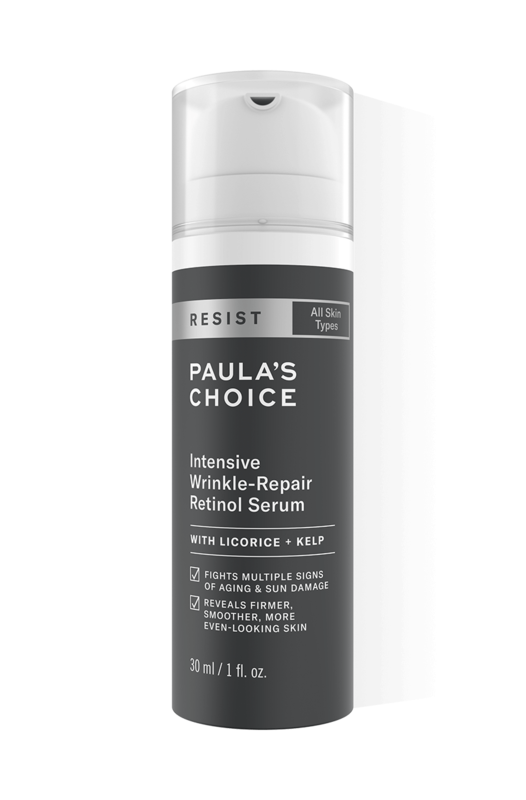 I was desperately seeking a skincare regime that would help alleviate some of these problems and the reviews of Paula's Choice products generally, seemed very good. I really wanted to like the Resist products and I have persevered with them, but sadly, they don't seem to work at all for me. Customer Care: Thank you for your review. We are sorry to hear that you haven't seen better results. Please contact our Customer Care Team so we can help you find products that may work better for you. 11 out of 10 for this serum - after testing out extensively with samples I took the plunge and bought the full size. This product really is fantastic, but packaging is ludicrous and pointlessly fiddly. What's wrong with a tube or even a normal pump? I am definitely a convert to Paula's range, she has sorted out my aging rosacea and eczma raddled skin, but this smacks of a marketing dept justifying their existence. Ok so, Paula has said on many reviews on this very webiste that palm oil can clog pores.. yet continues to put it in her product designed for all skin types.Therefore, no surprise I had a breakout. I must admit not a major breakout - two yellow heads because I used BHA 2% liquid before applying (which i highly recommend) Although I didn't like this product, the texture is silky gel like, great for dry skin types although obviously retinol can be drying I think the kernel and palm oil has sort of counter-balanced the dryness as I have not experienced any what so ever. Although I have previously been using prescription retinoid a for several months prior to changing to this. I cannot really comment on results as I haven't used it for full 12 weeks, which most retinol products require to actually see any difference. Although my skin has not been irritated by this product, skin feels smoother next morning. Although I think this is more down to 2% BHA liquid, which is best product Paula has to offer for oily skin. All in all - I don't hate this product, just for the money I would prefer one with more suitable ingredients for oily/combo skin. I had received a deluxe sample for this, and before it was over I had order the full size. I am early thirties with oily combination skin, and I always suffered from mild acne. This product worked miracles for me. I did not experience any break out period that people say that happens with retinol. I have been using it for almost 3 months now, and my acne has complete gone and my skin tone has tremendously improved. Perhaps it is worth mentioning that I alternate with the 2% BHA gel. In summary, I would recommend to try this if you are interested in a retinol product. Although I love the smooth texture of this serum which glides onto your skin and is absorbed in seconds, it dries out your skin and irritates it. I tried to stick with, but my skin is now red and raw. I have oily skin and don't understand what exactly made my skin so dry? Customer Care: We are sorry to hear of your experience and discomfort. We understand that each person will respond differently to products and ingredients. We will contact you to discuss an alternative for this product. I did not have much chance to use this product as it came with a faulty pump and I had to press 20 times to get a tiny bit of it. Then I took it with me on holiday in the mountains and it leaked so badly that there was almost nothing left in the bottle. I am back to skin recovery super antioxidant concentrate serum but would like to try the resist retinol serum again. Customer Care: Thank you for your review. We are sorry to hear that the pump of this product was malfunctioning. Please always contact our Customer Care Team in case of such an issue, so we can solve it to your satisfaction. I've used this product on my face only twice as the first time I had 3 nasty spots come up the morning after I used it. I gave it the benefit of the doubt and tried again a week later but I again had spots come up overnight, so I think this product is too thick, greasy and possibly silicone based? I might get a spot 2 or 3 times a year normally, and I've never had this reaction from a serum before but I did find it very greasy and heavy and not very pleasant to use on my face, so I'm using it up just on my hands instead. Disappointing product. Customer Care : Thank you for your review. We do wish you could have seen better results with this product. Result times may vary from person to person and depend on the extent of the concern you are addressing. We encourage you to contact customer care to discuss your skin type and how the product was being used. we will be more than pleased assisting in finding an alternative for you. I'm always cautious of products that contain retinol and this one has brought very mixed results for me. The slightly sun-damaged skin on my chest is definitely smoother but the skin round my eyes looks now looks crepey and flakey, my crows' feet are more pronounced and I have a strange new semicircular line above my eyelid that simply wasn't there before. Noting that the product is specifically advertised as being perfect for the area round the eyes, I persisted after the first application (with moisturiser) when the skin felt tight - but left two days before trying again. The skin started to flake: more moisturiser and another wait before my third attempt. I don't know if matters will approve with further applications but I'm not prepared to take the risk. I've resorted to petroleum jelly to soothe matters.I see belatedly from your American website that a significant minority of customers experienced the same side effects that I did. Bearing that in mind, is it a good idea to market this as "perfect" for the eye area?While generally a fan of your products and service - with reservations about the pricing - I'd have appreciated a warning that some people with sensitive skin should proceed with care when using this around their eyes. Customer Care : Thank you for your review. We do wish this product could have worked for you! However you are correct, it is our most potent Retinol Serum and may not work for those with more sensitive skin types.We will certainly pass your comments along to Paula and our product development manager. If you have any questions please feel free to contact customer care, we are always happy to help! This really is an exceptional product, the improvement in my skin is very visible but best of all it feels wonderful. I have not been economical in my use of this product and use it twice daily now, I will definitely be reordering! This is the most fantastic product I have ever used! I use it at night and then apply the hydrating mask on top - my skin has never looked so perfect (hydrated, even skin tone, wrinkles less visible). After reading all the reviews on the US website I was slightly concerned that it may be too strong for my skin as I usually react to even basic exfoliating products, AHA etc but no reaction sofar. I used to spend an absolute fortune on skincare and my skin never looked this good -so 10 out of 10 for value for money / consistency of serum and most importantly result. This is the best night product I've used so far. Using it with Resist exfoliants and even without applying a night cream my skin looks and feels great in the morning.. Love it!